In this remarkable author-illustrator debut that's perfect for fans of Last Stop on Market Street and Extra Yarn, a generous woman is rewarded by her community. Everyone in the neighborhood dreams of a taste of Omu's delicious stew! One by one, they follow their noses toward the scrumptious scent. And one by one, Omu offers a portion of her meal. Soon the pot is empty. Has she been so generous that she has nothing left for herself? Oge Mora graduated from the Rhode Island School of Design with a BFA in illustration. When not painting in her studio, Oge is in the kitchen cooking her late grandmother's recipes. 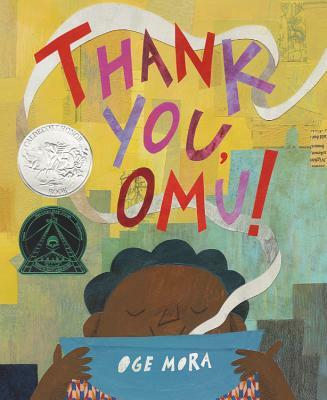 Her first picture book, Thank You, Omu!, was a Caldecott Honor, a New York Times Notable Book and Editors' Choice, and a Junior Library Guild selection. She lives in Providence, Rhode Island, and invites you to visit her website at www.ogemora.com. [*] "A lovely story of giving and community founded in Nigerian culture. Delectable." [*] "Mora [is] a major new talent.... Rhythmic, refrainlike...this sweet story of inclusivity, gratitude, and delicious fellowship is also a feast for the eyes." "Ideal...to use any time sharing is the theme."